This little piggy went to the market, this little piggy stayed home, and this little piggy spends the rest of its life inside a gestation crate, unable to move, cruelly crammed inside. 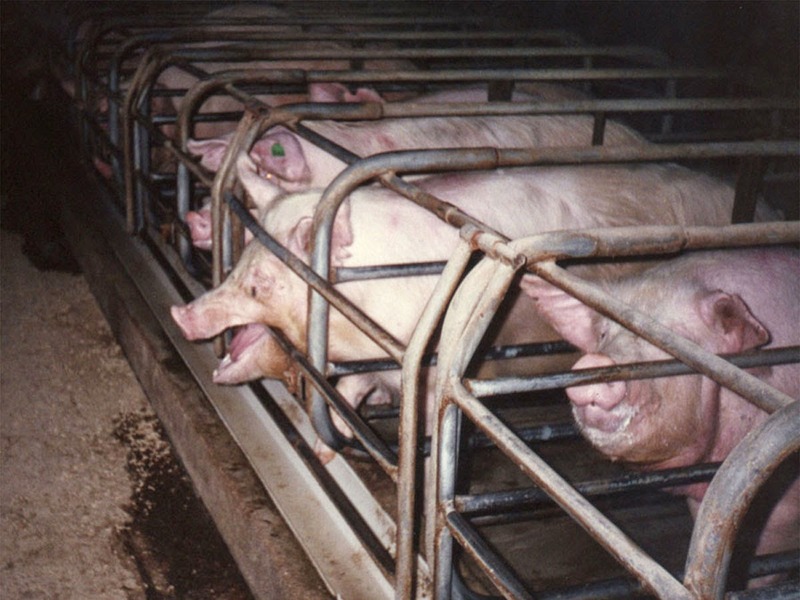 According to information collected, GESTATION CRATES are used in intensive pig farming - where sows are kept during pregnancy and in effect for most of their adult lives. These crates measure 6.6FT X 2.0 FT and can house sows weighing up to 900 lbs - not much room for a living being. 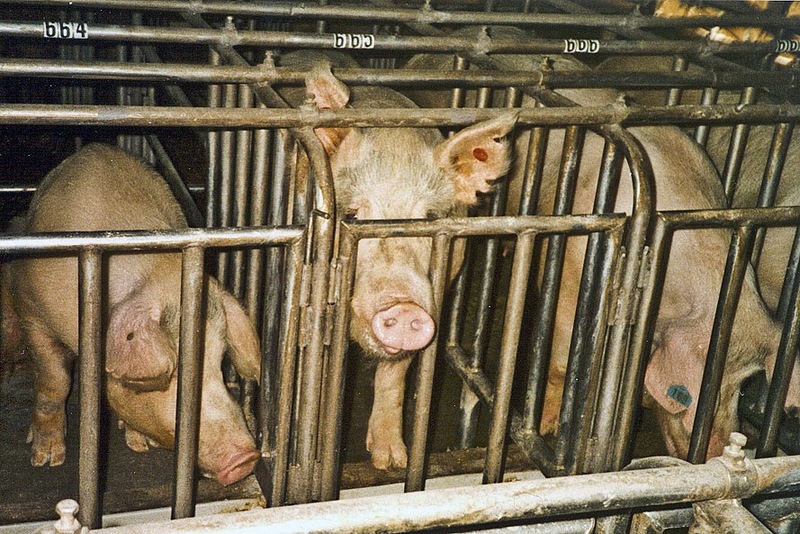 It is just this concern and issue that is giving negative attention to these "piggy prisons", stirring up outrage worldwide about the unhealthy and cruel conditions, which is leading many to protest and petition Governments and their officials to put a ban on the use of such "Crates of Cruelty". 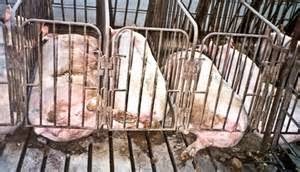 But it seems that those that are for these gestation crates, are arguing and firing back saying that such gestation crates are needed for these lives, because without them the pigs would develop a social heirarchy and fight between themselves. If this is truly the case of the matter --- then why are these crates not bigger or expanded so that these innocent lives at least are able to move and enjoy somewhat of their lives, instead of being crammed in a limited spot, creating unhealthy conditions, not only physically but perhaps psychologically as well. It is important that we understand and acknowledge the intelligence level of such animals - highly social, curious, form cooperative and sophisticated social groups, not to mention they feel pain, stress and fear - and it is clearly observed that such development is being damaged by such confinement and conditions of these crates - immobilized, creating suffering not only to the physical aspect of these living beings, but psychological as well (frustration, distress). According to further research, it seems that more companies are now moving away from the "Gestation Crate" Practice, due to these concerns and issues that these innocent beings are being subjected too and that individuals nationwide (including celebrities) are uniting their voices together to get legislation to get this practice outlawed - which in my opinion is a great idea, because this practice is not only cruel and inhumane, but I believe it to be a violation of the rights/welfare of these animals - which is a true crime against nature. We must not only gain the support and voices of individuals worldwide, but also the Government and Media Voices and Attention as well - for they hold certain powers and push that can make these crates of cruelty a thing of the past and to show that such inherently cruel methods of inhumanity have no place in a civilized society. It is time to put the rights and welfare of innocent animals first for a change, instead of the almighty dollar. Cruelty to living beings is unacceptable, and therefore needs to be stopped - for if such display of inhumanity was being put upon humanity, it would have been banned before it was even started - Let's give Animals the same respect and compassion... Join the Fight to Stop the Use of Gestation Crates.